Hair'itage The Play: The journey of Sistahs with Their Hair is a captivating play that tells the story of sistahs and their journey with their hair. 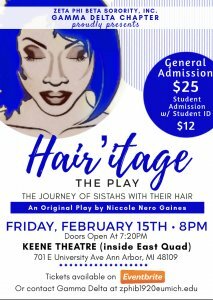 Each sistah shares their love-hate relationship with their hair; telling secret wishes and fears, jealousy and adoration, and the acceptance or rejection from their lovers, mothers, bosses, friends, and self. Playgoers leave in awes - empowered. Some even shed tears of joy, as they can relate to the storyline from a personal perspective. Hair'itage is a journey that women and men, from all walks of life, socio-economic backgrounds, and cultural backgrounds will enjoy. New York City - Brooklyn, NY - Somerset, NJ - Philadelphia, PA - Baltimore, MD, Detroit, MI - Los Angeles, CA.